OK all you smartypants out there! The first to identify "Where is this?" 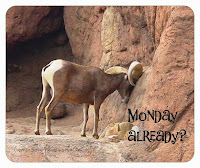 wins a you-know-what.... a fabulous TucsonDailyPhoto t-shirt with the famous Monday blues ram on it OR a mousepad with the same cool image. This portal to nature is embedded within an office complex. I look forward to your guesses! Is it La Placita Village? I've been there and it's so pretty. Hi Roberta & Chrissy, Thanks for checking in! I felt the same way after I left a very intense meeting. It provided me with a moment of meditation before going back to work. La Placita Village is similar with its painted buildings but HINT - this is further north. OK! Let me provide a BIG HINT! This is north of Ft Lowell and east of Alvernon. I can't wait to see the answer to this one...I am quite stumped. An office complex that has built the "Portal to the Catalinas"?! Another hint: This is across from a school. The office complex contains a mix of businesses - financial advisors, doctors offices, etc. ALL guesses welcome! Hey - Ellen, you usually chime in on these!! I've been wanting to say I'm totally baffled. I keep wondering if it's somewhere in the newish buildings at Swan and Camp Lowell, but the view seems too rural, like it really is on the edge of town. hmmm, you've got me this time! Well, I take that back! Google map/street level/satellite view showed me exactly where it is (given your hints)! Dear all, OK, OK, I will give you the location since Ellen has brought in her Google map/satellite technology to crack this one! This lovely portal to the Calalinas (as described by Elizabeth) is in the office complex on Paradise Falls Road - just north of Ft Lowell on Alvernon and turn right. The Davidson school is on the south; this is on the north. Just curious as I guessed above-is the name of the complex Rillito Crossing? An interesting name for a street: 'Paradise Falls Road'...but how about 'Paradise Found Lane'? I'm glad you enjoyed my Portal to the Catalinas thought for this serene view. As always, thanks for keeping the photos coming. Hi Anonymous. I don't think this complex has a name but I will double check and if Rillito Crossing is it, you will definitely be receiving the prize! I am out of town at the moment and won't be able to drive over there until next week. I'll keep you posted. Thank you! If you wish to avoid the Loans Geeks CMHC coverage charges, you ought to grow the real worth of the down payment to 20 percent. It’s far critical to word that the down price is predominantly meant to guard the hobbies of the loan lender.